If you haven't picked a place to eat tonight, you're in luck. Gayot has all the restaurant news for your area right here. Learn which new restaurants have opened in Las Vegas and which restaurants in Las Vegas have recently closed. Find out where your favorite chefs are cooking and locate special events. Coinciding with its one-year anniversary as an independent property, November 1, 2013, the Aliante Casino & Hotel opened FARM 24-7. The 2,200-square-foot, 24-hour café offers farm-to-table dining, serving a menu using ingredients sourced from local farms and farmers markets, and with décor featuring a variety of artistic photos and artifacts from the providing farms (including Cowboy Trail Farms and Gilcrease Orchard). Individual menu items are named after local streets, and all dishes are made entirely from scratch. FARM 24-7’s full menu is served 24 hours a day, along with a selection of beer and wine. FARM 24-7, 7300 N Aliante Pkwy, North Las Vegas, NV 89084, 702-692-7777. Buddy V’s Ristorante has opened at The Venetian inside the Grand Canal Shoppes. The Italian eatery is the first restaurant of renowned baker Buddy Valastro, star of TLC’s reality show Cake Boss, and is a partnership with veteran restaurateurs Elizabeth Blau and chef Kim Canteenwalla. Set in the former space of First Food & Bar, the décor is reminiscent of Valastro’s grandmother’s home in Hoboken, NJ, with rustic wood flooring mixed with subway tile, distressed brick, an open kitchen, light fixtures made of repurposed whisks and water jugs, and hanging panels made of vintage rolling pins; full-length windows afford views of the Strip. The Valastro family recipes are featured in dishes named for the family members who created them, such as Madeline’s cannellini bean and tomato bruschetta with Parmesan, garlic, virgin olive oil and basil; Lisa’s linguine and white clam sauce with white wine, dried chili and garlic; Aunt Nina’s upside-down mussels with bacon, fennel, garlic and white wine; and signature desserts including Buddy’s XL lobster tail consisting of custard cream, flaky pastry shell and seasonal fresh fruit. Buddy V’s is open daily for lunch and dinner. Buddy V’s Ristorante, 3355 Las Vegas Blvd. S., Las Vegas, NV 89109, 702-414-1000, 877-883-6423. Sammy’s Restaurant, Bar & Grill has opened a new location in Green Valley on the corner of Green Valley Parkway and Pebble Road, just north of the 215 freeway. Unlike other Sammy’s locations, this one serves a full menu 24 hours a day (in the tavern only) and also offers 24-hour gaming and live entertainment. A daily happy hour takes place from 3 p.m.-6 p.m. and again from 10 p.m.-1 a.m., with a special menu and $2 off drinks. On Mondays from 10 p.m. to 1 a.m., industry professionals receive two-for-one drinks; on Thursdays, ladies receive two-for-one drinks from 8 p.m.-midnight. Sammy’s Restaurant, Bar & Grill, 1501 North Green Valley Pkwy, Henderson, NV 89074, 702-567-4000. 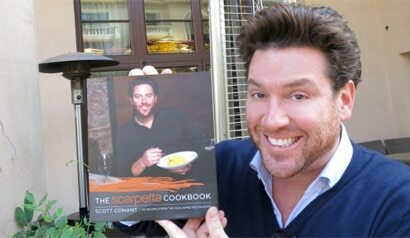 Try your hand at making chef Scott Conant’s creative Italian cuisine at home with The Scarpetta Cookbook. Read more on GAYOT's blog. Nosh Las Vegas is offering a food tasting and walking tour visiting restaurants on the Vegas Strip. Its inaugural route features eateries at Caesars Palace and is held Saturdays and Sundays from 3 p.m.-6 p.m. Priced at $59 and limited to 15 guests (age 21 and up only), the one-mile tour includes stops and tastes of a signature dish at five to seven Caesars Palace restaurants. During each stop, guests are given an overview of the restaurants' highlights and the tour guide shares fun facts and stories about the hotel. For more information or to make a reservation, visit noshlasvegas.com or call 702-763-7431. Caesars Palace, 3570 Las Vegas Blvd. S., Las Vegas, NV 89109, 702-731-7110, 877-427-7243. It has been announced by a Bellagio representative that the resort will not be entering into a new agreement after its contract with Todd English’s Olives expires this month, “as the resort prefers to develop a new concept for its guests. The restaurant will transition into a new name and menu early next year. Olives will continue to operate for the coming months as the resort’s team finalizes details for the new restaurant.” Olives was one of the first restaurants to open at the Bellagio, opening in 1998 when the hotel debuted. Olives, Bellagio, 3600 Las Vegas Blvd. S., Las Vegas, NV 89109, 702-693-8181. Anthony Zappola has been appointed executive chef of the newly opened Tom Colicchio's Heritage Steak at The Mirage. The Cleveland native is a Le Cordon Bleu London graduate, and spent eight years working for Colicchio at Craft restaurants in New York and L.A. Zappola was also formerly the executive chef at The Royce Wood-Fired Steakhouse at The Langham Huntington, Pasadena. Tom Colicchio's Heritage Steak, The Mirage, 3400 Las Vegas Blvd. S., Las Vegas, NV 89109, 702-791-7330. Take your taste buds on a walk down memory lane! Check out our exclusive closed restaurant database for Las Vegas to virtually visit your favorite dining spots from yesteryear. Aristocrat, R.I.P. N9NE Steakhouse at the Palms Casino Resort will be closed for renovations beginning November 10. It is scheduled to reopen December 16. N9NE Steakhouse, Palms Casino Resort, 4321 W. Flamingo Rd., Las Vegas, NV 89103, 702-933-9900. Wing Lei Chinese restaurant at Wynn Las Vegas closed October 8 to undergo a complete renovation of the restaurant’s interiors. Also closing for refurbishment is Bartolotta Ristorante di Mare, which will close November 3. Both restaurants plan to reopen December 21. Wynn Las Vegas, 3131 Las Vegas Blvd. S., Las Vegas, NV 89109, 702-770-7000, 1-888-320-WYNN.